It’s been well over a year now since I started grabbing various Windows 7 release candidates, and most of my machines got their initial RTM installs in August, 2009, when MSDN made the RTM available two full months before the official release of Windows 7 in late October. I’ve recently noticed with increasing irritation that my Windows 7 boot screen still includes references to various RC (Release Candidate) versions even on PCs that have long since had those entries removed from the hard disks present in those machines. 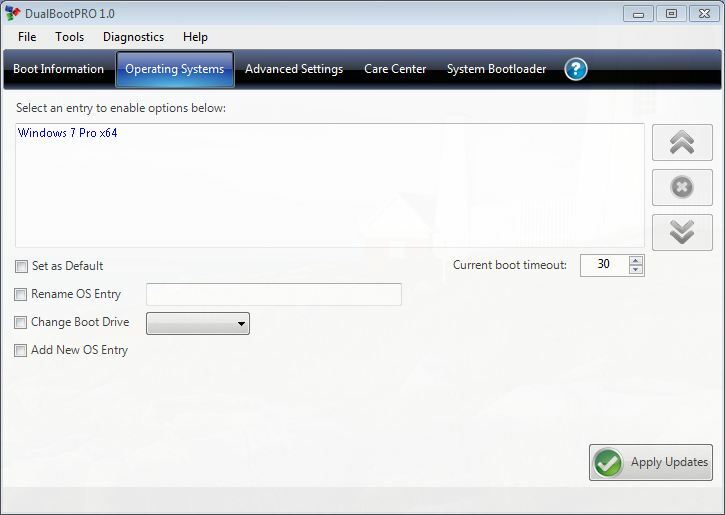 For Windows Vista, I turned to a freeware product called EasyBCD that made it much easier to rework the Boot Configuration Data (which is what BCD stands for in modern Windows OSes). But alas, that product is no longer available, and besides it’s not warranted to work with Windows 7. And if there’s anything you DON’T want to muck around with on a Windows Vista, 7, or Server 2008 machine it’s the boot configuration data. 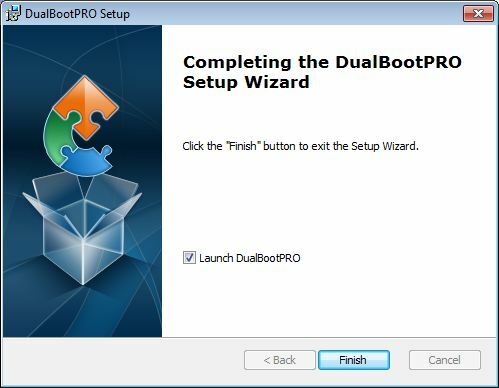 This led me on a search for a replacement tool, and what I came up with is called Dual Boot Pro a capable, usable, and cheap ($9.95) tool that works like a champ on PCs that include BCD based Windows OSes among their OS lineups. 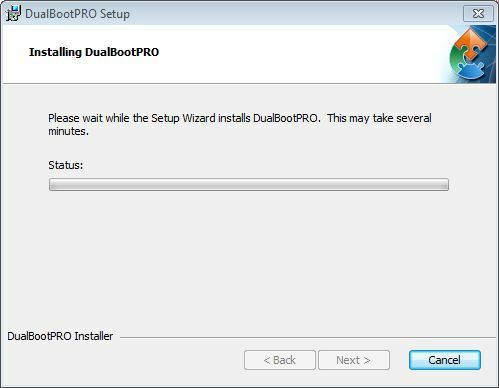 Let’s take a guided tour of installing and using Dual Boot Pro, because it will show you everything you need to know as I demonstrate how to remove offending items from the boot menu and manage various boot settings as well. 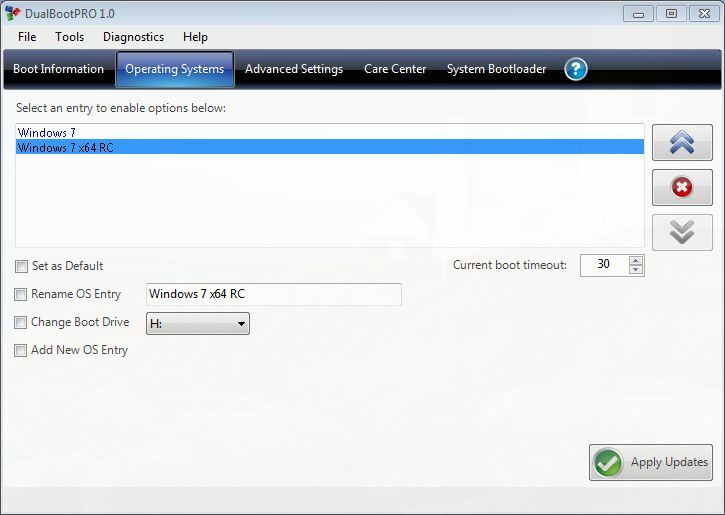 After you pay for then download the software from the vistabootpro.org Web pages, you will obtain a Windows installer (.msi) file that you must double-click to launch the installer process. Installation takes you through a total of two basic screens, and took under a minute on my test PC. When the (brief) install process completes, click a button to finish things up. The first time you run the program, you will be warned that it detects no backup of the BCD data for your system, and guided to create such a backup. 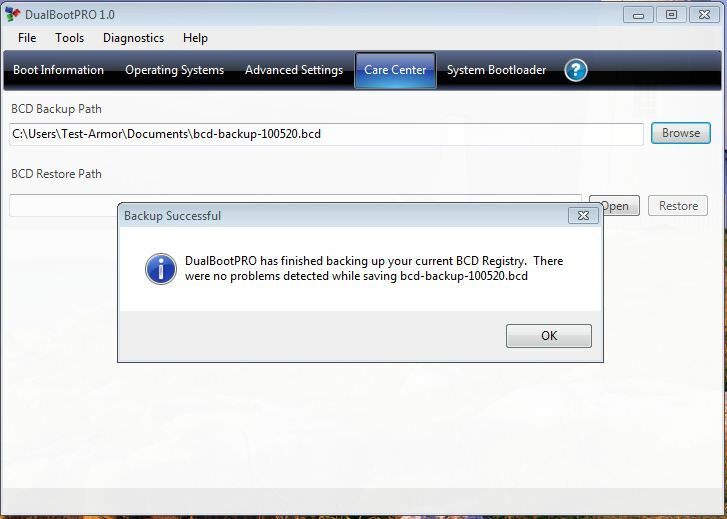 On subsequent uses of the program, it’s up to you to remember that backing up BCD data before making any changes is a really, really good idea, and to use the Care Center tab to create (or restore) such backups as needed. When no BCD backup is detected, you are asked to create one. When the backup is saved, the program tells you if the save is valid or otherwise. 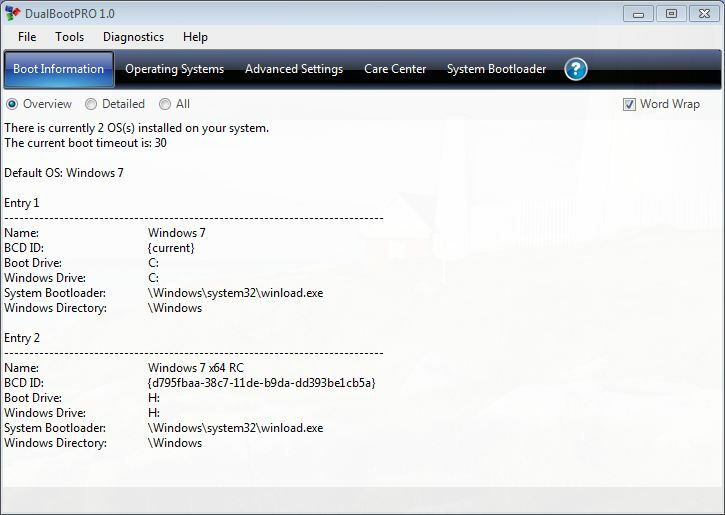 Click on the Boot Information tab to view the current BCD information and name information (it’s what shows up on the Windows 7 boot screen as the OS is starting up). Notice that in the next screen cap, Windows 7 x64 RC still shows up (even though it’s no longer resident on this PC). There are two entries in the BCD, even though one is now MIA! To edit BCD data, click the Operating Systems tab in Dual Boot Pro. Then, you can select any individual entry and either alter its data (through the controls below the listing pane), or click the Red X (Delete) control to the right of the listing pane. That’s what I’ll do to get rid of the obsolete RC entry. Before: highlight the entry you wish to delete, then click the Red X. 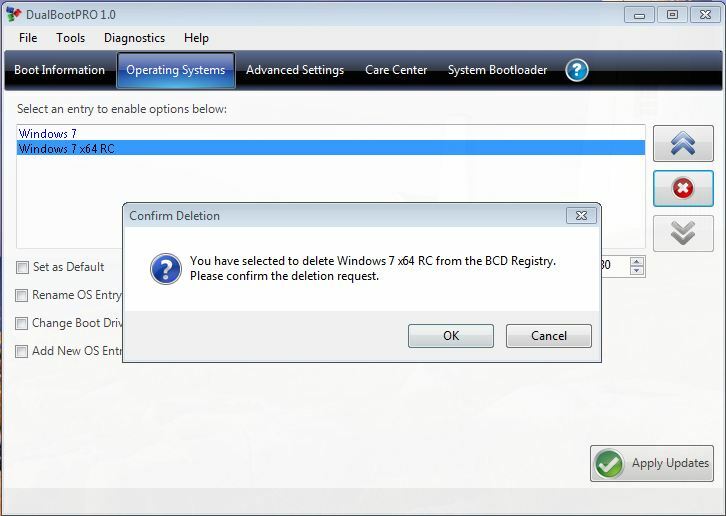 As you might hope, Dual Boot Pro asks you to confirm any entry deletions. On this same screen you can also edit existing entries to provide a different, more descriptive name. I like to know what version and word-length attaches to the Windows Versions I have running on my machines, so I usually add that info to the name to help me remember (hint: you must always highlight an entry in the entries pane at top center before you can add or apply data related to that entry in the controls and buttons below). Once the change is applied, the new name data shows up in the entry pane. There’s a lot to like about this useful little program. If you spend some time getting to know the software, you’ll come to appreciate its capabilities. Business licenses are available, and cost $24.99 per license (which may be used on up to five computers). Commercial and Corporate licenses start at $4.99 per seat and go down in price as the number of licenses go up ($3.95 for 101-500 licenses, $2.95 for 501 licenses and up). [A href="http://www.boyans.net"]Visual BCD Editor[/A] is a complete Windows 7 BCD editor not a partial implementation as other BCD GUI tools. VBCD can create automatically loaders for Windows XP, Vista and Windows 7/8 so dual booting is not a problem. Unique automatic dual boot repair functionality working for all current Windows versions even Windows 8.